Mobile phone cameras are everywhere nowadays, but their ubiquity hasn't really improved the quality of videos that you can take. They're still grainy and jumpy and don't look good on the big screen. FixMyMovie aims to help you cover up these video deficits. FixMyMovie lets you upload your mobile phone, webcam, and digital camera videos and automatically fixes them before public consumption. Your video files will likely have the extensions: .3g2, .3gp, .mp4, or .avi. You'll first view a couple still images of the enhance video before you give the final go-ahead to process and clean up the entire movie. 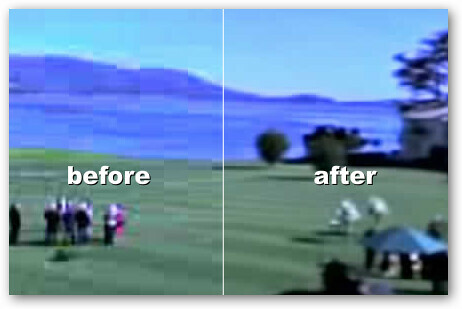 Afterwards, you can compare the two videos side-by-side to see how well FixMyMovie really fixed your movie. Then you can download your newly spiffy video as a Quicktime, Windows Media, or Flash file. In the future, you will be able to embed videos too. It takes processing credits to use FixMyMovie, but it looks like you get $25 worth for free just by signing up.